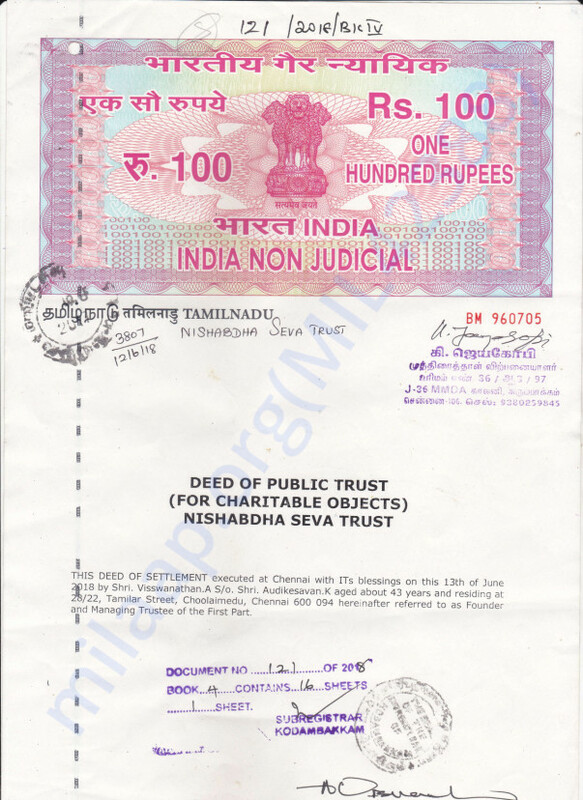 Nishabdha Seva Trust is a registered public charitable trust head quartered in Chennai, India. The main objective of the Trust is to cater to the genuine needs of those who approach the Trustees for help and support. Nishabdha's Core services are Health, Education and Empowerment for all i.e to provide World class Fee-less Education and Health with care.The Trust helps one to study or work in his or her lines of passion with a motto "Work builds, charity destroys". The Trust provides medical help to all those unreached especially for transplantations like Bone Marrow, Kidney, Liver, etc. With ITs blessings, We invite you to be ITs instrument to serve the needy together. Income for Nishabdha Seva Trust is through little contribution from each and every individual i.e crowd funding for all the social causes inclusive of Trust's operating and maintenance expenditures. Estimate of Operating and maintenance costs FY 2018-19 for Nishabdha Seva Trust in INR.